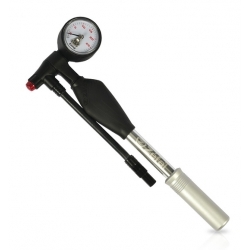 The Zefal Z-Shock suspension pump allows you to pump your forks to a maximum pressure of 25 bar (360 psi). It's robust, has a light weight (235 g according to the manufacturer) and flexible to fit around your bike. The hose and dial can be turned through 360 degrees. Ideal for suspension forks or rear air suspension units, on mountain bikes or other types of bikes such as recumbents and velomobiles.